It looks as though Prince Naseem Hamed the broadcaster is going to be every bit as outspoken, outrageous, abrasive, divisive, unique and downright entertaining as Prince Naseem Hamed the boxer was in the 90’s and early 00’s. ‘Naz’ worked ITV’s broadcast of the World Boxing Super Series(WBSS) super-middleweight semi-final between countrymen George Groves and Chris Eubank Jr. at the Manchester Arena on Saturday night. It was a wild, bloody and absorbing contest, with WBA champion Groves doing most of the clean work behind his quality left jab while the far less cultured but tremendously tough and athletic Eubank tried desperately to instigate a brawl. As he struggled to close the distance, the gritty, rugged Eubank often resorted to rushing and lunging at Groves or winging speculative haymakers, which at times made him look very amateurish indeed. Though Eubank still had some success, the performance was a tad unbecoming of a fighter who, along with his famous father and namesake, had built himself up to be a member of the sport’s elite. In the end, Eubank lost via unanimous decision, with the three judges at ringside handing in scores of 115-113, 116-112, and 117-112. He dropped his lightly regarded IBO title in the process. With the win, Groves progressed to the WBSS final, where he will meet the winner of next weekend’s semi between England’s Callum Smith and German veteran Juergen Braehmer. The final was originally scheduled to take place in May but Groves appeared to suffer a shoulder injury in the final round on Saturday and may require a longer break. 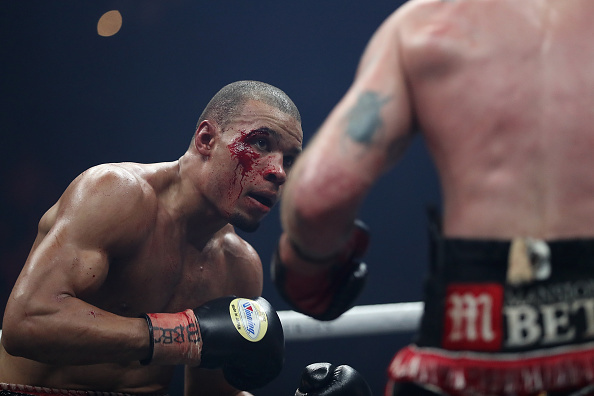 Eubank Jr. suffered a cut early on as a result of a clash of heads. In the ring after the fight, Eubank promised to rebound and expressed an interest in facing a couple of the world’s other top super-middleweights, James DeGale and Caleb Truax specifically. Hamed, however, doesn’t feel that Eubank should be looking towards such fights. Or any fights for that matter. During his post-fight analysis, the prince launched into a cutting tirade against Eubank, whom he had tipped for victory earlier in the evening, going so far as to suggest that he should retire at the age of 28. It’s unlikely that anything Groves landed on Eubank during their twelve rounds in the ring together was as hurtful as these verbal shots from Hamed. You can watch a compilation of Hamed’s most cutting comments from the broadcast below courtesy of the BuzzyNews UK YouTube channel.